Hurricane Sandy caused a lot of damage, and it's going to take a long time to get everything fixed back up. Not everything succumbed to Sandy's destructive force, however. This little surfing robot, for example, survived on the high seas despite the storm, never failing to do its duty all the while. 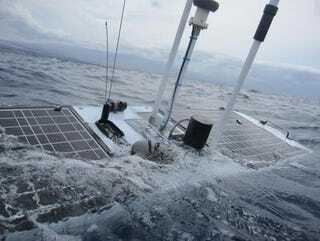 One tough little Wave Glider robot, dubbed "Mercury" by its makers Liquid Robotics, had the misfortune of being about 100 miles east of Tom's River when that beast hurricane Sandy came rumbling towards land. But despite being caught in winds of up to 80 mph, the Wave Glider just kept on trucking, continuing to report home with the barometric pressure every 10 minutes regardless of rough seas. Designed with a float that floats (duh) above the surface, and a submersible part below, Wave Gliders use mechanized wings to use the ocean's natural wave energy to push forward. And that's what Mercury did throughout the whole storm, even reporting a precipitous 54.3 millibar drop in pressure as Sandy neared the shore.